I get three types of organic greens, spinach, methi and amaranth every week and sometimes the methi leaves bunch turns out to be a really big one. After making the usual stuff with them, I had some more and I was looking out for something new to try with it. 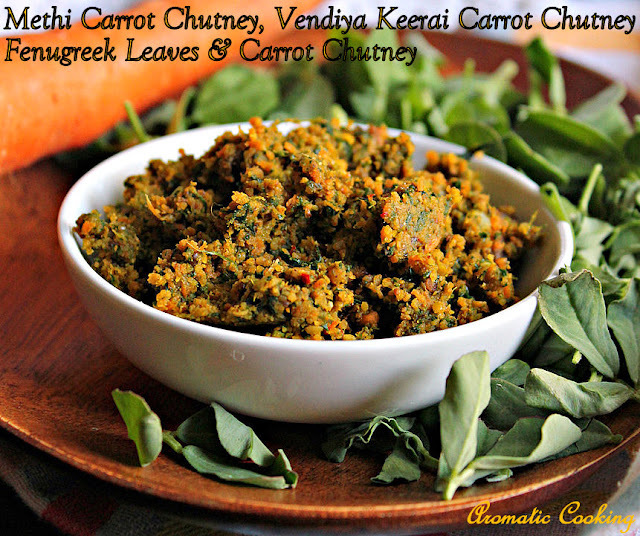 I looked up for some chutney recipes with fenugreek leaves and finally decided to make this one with methi/vendiya keerai and carrots. This chutney has a coarse texture and tastes best when mixed with some rice and ghee. This is the first time I made this and we loved it, it goes well with some curd rice too..
Wash and keep the methi leaves. Heat a few drops of oil oil, add the chana dal, urad dal, red chilly, cumin seeds and mustard seeds, and roast, then add the garlic and roast everything till golden, remove and keep. Add a little oil to the same pan, add the methi leaves and saute for about 2 to 3 minutes, till it shrinks, remove and keep. Now heat another 1/2 teaspoon of oil, add the green chilly and carrots and saute for 3 to 4 minutes, till the raw smell of carrots goes away, add the tamarind, remove and cool all the roasted and sauteed ingredients. First add only the roasted dal mixture and grind to a coarse powder. Then add the carrot, green chilly, tamarind, jaggery and methi and grind everything into a coarse mixture without adding water. Remove and store. It's 1 cup of methi leaves before washing. 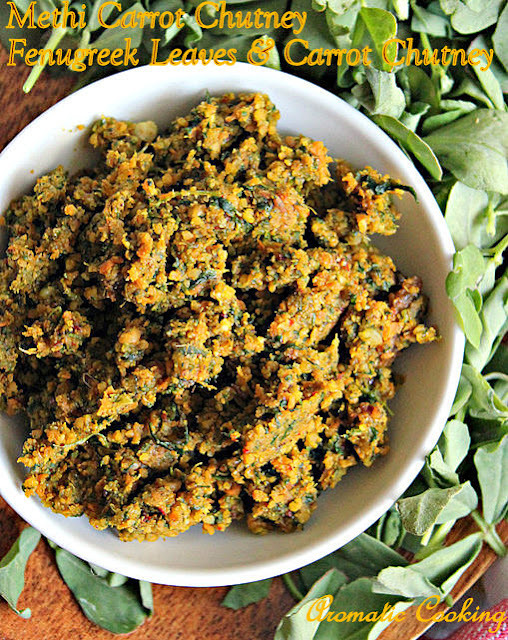 The chutney should have a coarse texture, if the methi is very bitter, add some more jaggery. I always thought chutney is very much like sauce, but now this one looks like a great appeitzer to me. Healthy chutney!Loved the color combination!